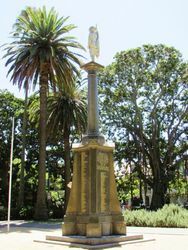 Redfern War Memorial commemorates those who died in service or were killed in action during World War One. 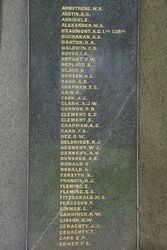 The foundation stone for the memorial was laid on the 1st November 1919 and not the 2nd November as stated on the memorial. 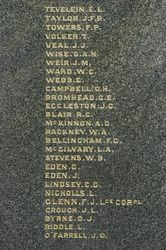 The memorial was unveiled on the 28th January 1920. Two white marble figures (Australian soldier and a young woman) dress a granite monument which is faced with a dedicatory plaque and a list of local men who gave their lives. 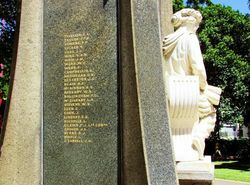 The memorial also featured a tall column up until 1975 when a storm caused considerable damage, resulting in the subsequent repositioning of principal elements. More than 1000 persons gathered at Redfern Park this afternoon to witness the laying of the foundation-stone of the memorial to be erected in honour of Redfern soldiers who fell in the war. 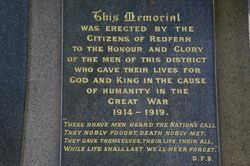 Archdeacon Boyce, who for many years has been connected with Redfern, said that the large crowd was a testimony to the honor in which those who had given their lives for Australia were held by their fellow-countrymen. The worth of the Australian soldiers is testified to by both by friend and foe. Their honor and memory would never fade. 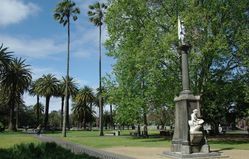 Perhaps one hundred years hence there would be held around the memorial a meeting of another generation to show that the work done by these men would he remembered as long as the race existed. The Rev. L. Hurd, representing the Methodist Church, also spoke. 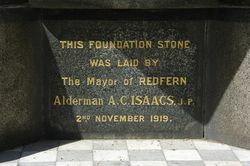 In laying the stone, the Mayor, Alderman Isaacs, said that the stone would commemorate the sacrifice made by residents of Redfern in the cause ot humanity. Evening News (Sydney), 1 November 1919. 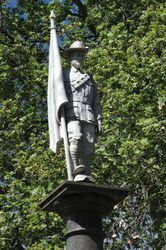 The memorial erected by the citizens of Redfern-a granite column surmounted by the figure of an Australian soldier in marble-at Redfern Park to the memory of the men from the district who fell in the war was unveiled yesterday afternoon. Several hundred people were present, most of them parents or relations of those whose memory is perpetuated by the memorial. 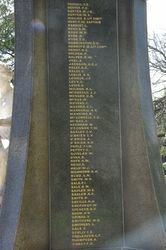 It was mentioned by the Mayor (Alderman A. C. Isaacs) that the municipality was entitled to take an additional pride in the memorial for the necessary funds had been raised not from donations of substantial sums by a few people, but almost entirely from the shillings and sixpences and threepenny pieces collected by a band of willing workers associated with the committee. In unveiling the memorial, Mr.J. 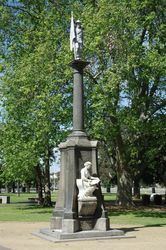 S. T. M'Gowen, M.L.C., who had himself lost a son in the war, paid a tribute to the valour of the Australian soldier and to the sacrifice in the cause of national freedom made by those who had given up their lives. The memorial cost £1000. The Sydney Morning Herald (NSW), 29 January 1920. Alderman A. C. Isaacs, J. P.
They Nobly Fought. Death Nobly Met . While Life Shall Last We'll Ne'er Forget ."